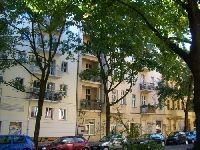 Berliners looking for low rents are moving eastwards and Friedrichshain is the latest stop in this inevitable push. The district has become increasingly popular especially with students and for its alternative scene, with second-hand clothes shops and trendy clubs, and it is currently considered a young peoples quarter. Karl-Marx-Allee, Friedrichshains main thoroughfare, close to the centre of East Berlin, is in the old Soviet style long, wide and majestic. The local bars and clubs are concentrated along Simon-Dach-Strae, while the more alternative crowd meets on either side of Karl-Marx-Allee, and particularly in Rigaer Strae. The bars near Ostkreuz are more sedate. Friedrichshain also boasts the East Side Gallery, which is the longest preserved piece of the Berlin Wall, covered with interesting graffiti art. Friedrichshain is crossed by Berlin's west-east overground route (S3, S5, S7, S9), while the S41/42 ring train and the S8 provide links north-south to Prenzlauer Berg, Neuklln and Schnefeld airport. The U5 underground runs alongside Karl-Marx-Allee and the U1 heads west via Kreuzberg. Ostbahnhof, East Berlins former central station, is Berlin's most important intercity rail hub after Zoo.